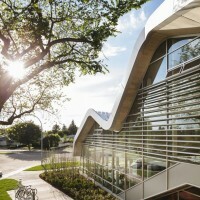 HCMA Architecture + Design together with Dub Architects have designed the Jasper Place Branch Library in Edmonton, Canada. 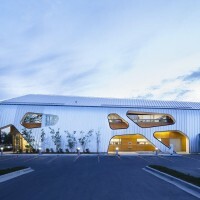 A shortlisted project for the World Building of the Year 2013, Jasper Place Library is a joint-venture between HCMA Architecture + Design and Dub Architects. 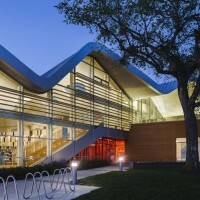 The City of Edmonton aspired to create an open and memorable presence in the community with the replacement Jasper Place Library. 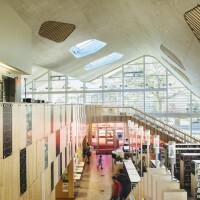 The City required a sustainable design to fulfill present and future library needs and uses, to welcome all demographics and to accommodate future reorganizations of the collection and reading areas. What is a Library that has no books? 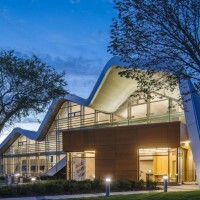 This is the central question that informed the design of the Jasper Place Branch Library. 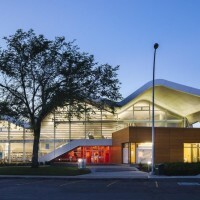 This project, one of many branch libraries within the Edmonton Public Library’s system, replaced an earlier small library which was located on the same site. 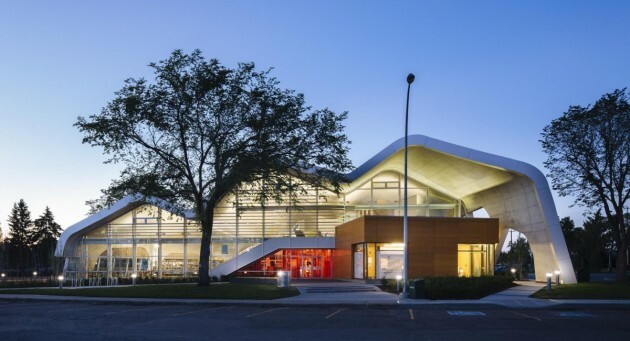 The client’s goals focused upon providing a new social heart within an older suburban neighbourhood while providing a flexible building that responds to the dramatic changes currently taking place within the delivery of library services. While it is debatable whether or not books will completely disappear from our libraries it is clear that the size and nature of the collections they house is changing and that within the life span of this building the needs of the collection will be much different than it is today. In fact due to a variety of factors including e-books and the access to online information, the collection has already reduced significantly. While the new library is twice in area to the library it replaced the number of items in the collection has in fact reduced. 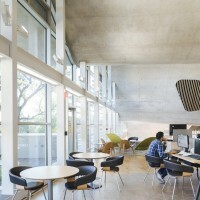 This highlights the change in focus from the imperatives of the collection to maximizing the potential for social space. It is our view that in order to respond to changing needs the Library of the Future needs to be designed to maximize its social potential. 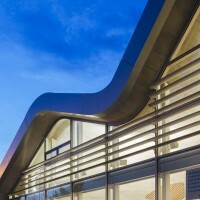 This was what drove the design of this project. 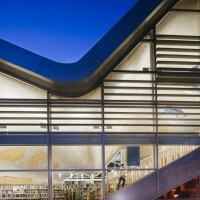 The library is organized by a large flexible social space that is sheltered by a column-free undulating roof form. 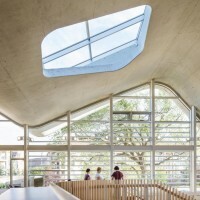 This space incorporates a continuous raised floor that allows for flexibility over time and eliminated the need for services at the roof level. 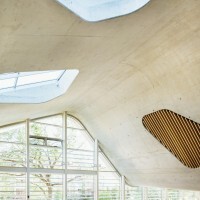 The social space in turn folds up from the ground place allowing for the insertion of “back of house” functions beneath a raised portion of the social space. 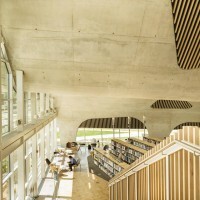 Stairs (one of which also acts as both social space and informal amphitheatre) are located at each end of the upper level and form a continuous circulation loop. An outdoor terrace extends the public space at the south side of the upper level. The needs of the social spaces were given priority in the planning with the collections being used to define and enhance the social needs. 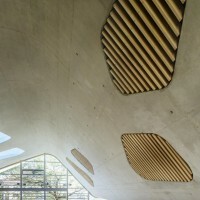 The movement of the roof form creates differing characters and spatial conditions that help to define use. 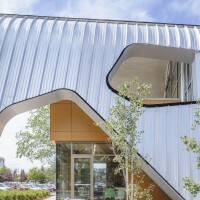 The overall result is an open, inviting and memorable public space that provides a strong public presence in a neighbourhood that has lacked meaningful indoor public space.